Mark to market refers to an investment measure or accounting tool used to record an asset’s value to reflect the market value of the security rather than its book value. The tool is commonly used on futures accounts and helps to ensure that all margin requirements have been completed. When it comes to mutual funds, mark to market refers to how a fund’s net asset value is calculated every day based on the underlying investment closing prices. In security trading, when a portfolio or investment is marked to market, then its value is usually changed in order to reflect the current market price. Investors usually take advantage of this when they are holding a position through the end of the year. Instead of being forced to close it out to realize a loss or gain, you can simply to choose to mark to market the position which will establish the position at the market price for when you file your taxes. This is the second part of the article. The first part can be accessed here. This is the stage in which you learn to specialize in certain markets and trading methods. You test your methods and they seem to work. You gain tremendous market knowledge. You reflect back on yourself and you can’t help but laugh at your foolishness. You calculate risk before profits and place strict money management on all your trades. You cut losses short and learn to scale out on your winners. Your psychological makeup has changed from an amateur mindset to a professional one. Calendar spread is an options strategy that allows traders and investors to enter long and short positions simultaneously for the same underlying and strike price but different expiration dates. Option traders can utilize calendar spreads as a way to get into a long position at a cheaper price by selling the other leg and bringing in a credit. As a result, the option trader has the choice of owning longer-term calls or puts for less money. Keep in mind that this strategy can be used with both calls or puts. As said earlier, the calendar spread is an option trading strategy where a trader opens two legs with different expiring dates for the same security. In the picture above, you can see that we are selling the earlier expiration (aka the front month) in January and buying the longer expiration set for February. Your max loss on this trade is your net debit you paid to open the position while your max gain is theoretically unlimited. Today I want to talk about a topic that could turn a lot of losing traders into profitable and professional traders. In our pro forum, I keep coming back to this topic quite often because I know about the importance and in the pro area, we have now seen many times that traders who follow this way of thinking, have a better chance of becoming profitable. I completely understand that this will be a tough pill to swallow but I always think that being honest and having realistic expectations is a key to trading success. In trading, there is a time to make money and there is a time to study and work on yourself. When you are just starting out, you should not focus on making money and you have to completely detach yourself from the belief that you’ll earn a great living anytime soon. Good traders are known to be masters of risk management. Risk management includes following a detailed trading plan, setting stop and limit orders and managing traders without succumbing to emotions. Good traders also tend to follow a robust trading plan that focuses more on ensuring that the traders do not lose their capital, while the profits are seen as only secondary. As part of this pursuit in achieving trading excellence, professional and seasoned traders follow the concept of setting limits on their losses, on a daily, weekly and even monthly basis. 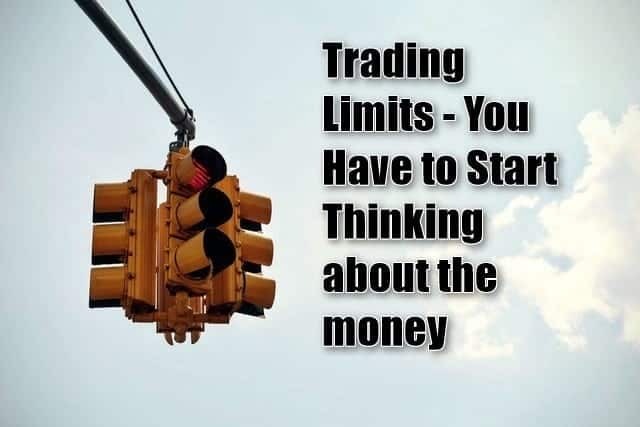 Trading with limits ensures that the traders do not end up sabotaging themselves in the heat of the moment as emotions can often override logic when a trade turns into a loss.